The last 4 nights have been spent rewiring the Caron Street boards (the industrial switching district) to simplify the wiring, although I spent two entire nights trying to find and fix shorts! But finally all sorted! Previously the entire trackage was block detected, but I decided that it was unnecessary and not prototypical, so now just the main tracks have block detection. This has allowed me to add extra blocks to help with signalling and has also given me 8 free blocks that I can now use on the new ‘joining’ boards, saving the purchase of a 3rd BDL168 detector. In addition, I have added a PSX power breaker for the Caron Street tracks, putting an end to entire layout shorting while switching! While at it, I have also added a new accessory bus to be used with a Tam Valley Depot DCC accessory booster (arriving in the next few days), so finally I can change turnouts even if there is a short, and giving extra power back to running trains. I also re-did my track plan in Railroad & Co, as for some reason the original file had disappeared, but I’ve now also add the 3 new ‘joining’ boards, with their flyover. So, the final bit of work to do on the current boards is to add the accessory booster when it arrives. Then I can finally get back to adding the track to the new boards and wiring it all up. Comments Off on Rewiring…just for fun! I’ve started tracklaying on the new boards. As you can see below, I have decided to add an exciting feature to relieve the boredom of the flat track on the rest of the layout. There will be a 3% grade rising to about 2.5in, then going back down to normal track level again. 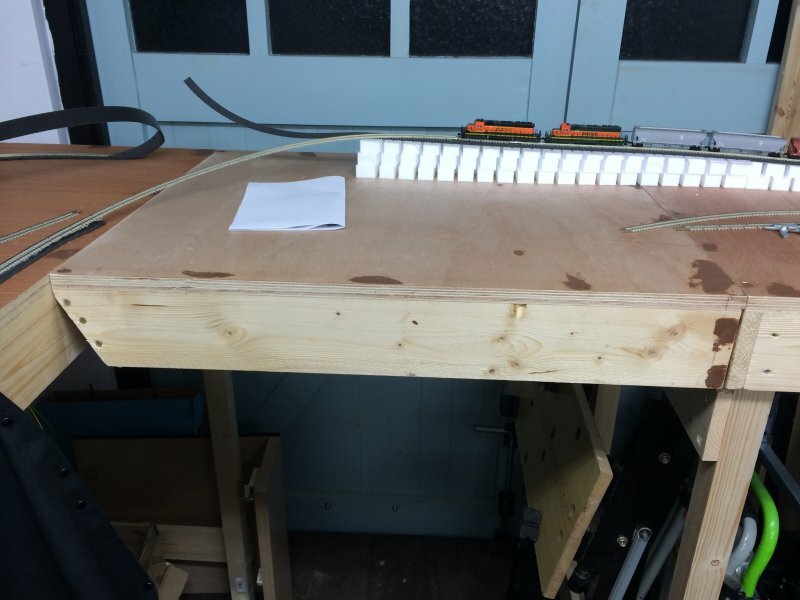 This will enable one track to go under the other one, easing the radius needed on this end of the layout. It will also enable me to run another track off behind the existing intermodal yard, at a height of 2.5in which will be the location of the new storage yard. I have yet to start designing this section, but hopefully I will be able to have 3 or 4 storage tracks and perhaps even a loco yard. Here is one end of the 3% grade. The grade will level out where the second locomotive is and will run flat for a while, including a turnout (and possibly a crossing) which will run off to the storage yard on the right and will also include a small bridge which will go over the lower track. The grade will then start descending back down to the board level on the left. As you can see I am using the excellent Woodland Scenics gradient starters and risers – brilliant products…make adding a gradient so easy! The image below shows the lifting module (mechanism not added yet). This will be a tricky one as it will include track at angles and also track at a gradient – should be an interesting project! I hope to have the gradient in place in the next two weeks – just a bit more design work to do first!